From left, Aspen Fire Protection District President Karl Adam, Leonard "Boogie" Weinglass, his wife, Gail Weinglass and Aspen Fire Chief Rick Balentine on Tuesday celebrate the Weinglass' spur of the moment donation of $126,500 to buy a new fire truck for the department. Aspen Fire Chief Rick Balentine wasn’t on a fundraising mission when he agreed to speak at a men’s luncheon late last week at the Chabad Jewish Community Center on Main Street. After about an hour of answering questions from about 35 men in attendance, Leonard “Boogie” Weinglass approached Balentine and asked if he had any needs he wished could be fulfilled immediately, Balentine said. Weinglass — a wealthy philanthropist and businessman who’s lived in Aspen for more than three decades — pledged $100,000 on the spot for a new fire truck, and later agreed to cover the entire $126,500 cost of the vehicle, Balentine said. “The whole room kinda went, ‘Whoa!’” he said. “I tend to keep my emotions intact, but when I got to my car, I kinda teared up a bit. The truck that broke down is 20 years old and Balentine said he was hoping to replace it out of next year’s budget. In fact, Balentine said he had already found a good deal on a 2017 “Type 6” fire truck in Salt Lake City. The day after Weinglass offered to buy the truck, Balentine had a check in hand. Members of the Aspen Volunteer Fire Department plan to leave today to pick up the new truck, he said. “I’ve known Boogie for a long time,” Balentine said. “He’s always been one of the most community-minded people in town. In an interview Wednesday at the Aspen Fire Station downtown, Weinglass said the Lake Christine Fire has made an impression on him. His daughter, Sage, and her two young sons were evacuated from their Shadow Rock home because of the blaze, and he said he had a chance to see some of the fire’s devastation up close. The donation from Weinglass and his wife, Gail, not only makes the Aspen and upper Roaring Fork Valley community safer, it will save taxpayers money because the fire department is mainly funded by property taxes, Balentine said. In addition, the new truck will allow the Aspen fire department to again deploy a truck and firefighters to help fight other blazes around the state, he said. That practice had to stop once the fire truck broke down because the department only has two of that type of truck and one has to be on hand in case of local fires, Balentine said. There was one condition Balentine said he insisted on before accepting Weinglass’ money, however. “I wouldn’t accept the cash until he agreed to allow his name on the new engine,” Balentine said. 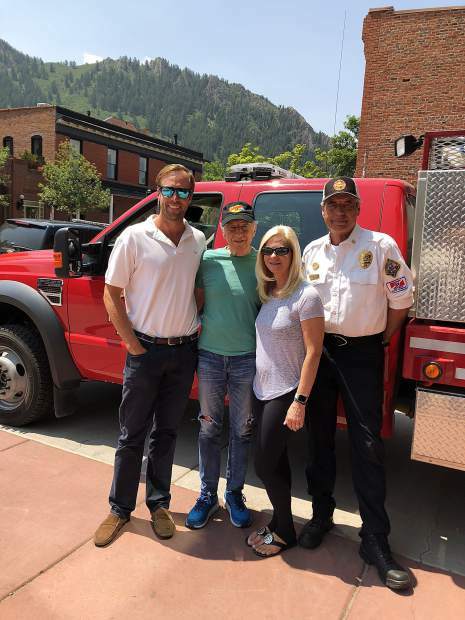 For Boogie Weinglass, a founder of The Buddy Program, the fire truck gift is part of his history of giving back to the Aspen community.